Some of you will be familiar with this tiny Highland village though many are unaware of its location and appeal. Allow me to introduce you to Glenelg, one of the true hidden gems of Scotland. From the main ‘road to the Isles’ up the west coast an abrupt turn over Shiel Bridge takes us onto the Mam Rattagan pass which is a totally memorable drive, albeit not for the faint-hearted. Make sure and take a peak from behind the wheel at the fabulous viewpoint offering views over to The Five Sister’s of Kintail mountains due east, a sight to behold. The road is used for logging purposes but once featured herds of cattle and their drovers who were charged with the task of fording the Sounds of Sleat with their cattle on the journey from Skye to lowland market places. General Wade (or was it Thomas Telford?) dropped by this way too and constructed the odd military bridge along the road now taking the odd logging lorry to its credit. At various intervals there are passing places and the odd barrier shielding the tight corners and sheer drops but not everywhere by any means so keep a sober head! After the drama of the pass, the road descends through entirely pleasant pasture land and into the village. It was here on my first visit that I spotted a large imposing white house on the left which had been Glenelg’s former manse. Here would be my abode for the next week. Before actually entering the village there is yet another sight to be aware of, the Hanoverian barracks which sits in scrubland to the right of the road. Upon my last visit the much ignored building surround by wire fencing had lost none of its interest due to the effect of the neglect offered it. Although fenced off from the public, I just had to crawl through a hole in the cordon and take a closer look at this scene of activity during the past. Apparently Bonnie Prince Charlie’s troops had commandeered the building during the time of the ’45 rebellion – how could anyone with a trace of romance in their soul drive past such an artefact of a different age? Glenelg boasts but one watering hole- The Glenelg Inn. Boswell and Johnson recorded their disappointment at their lodgings in the hostelry in their separate tomes. The fact that the intrepid two were hugely disappointed at their place of rest after a hard day tramping on pony back over the pass need not deter the reader or potential visitor. Boswell’s mention of ‘rough rushes on the floor to sleep upon’ has changed slightly in the modern era. On my last visit to the gorgeous Glenelg Inn I enjoyed a fantastic night with the locals after a sit in the atmospheric back garden peering over the silvery Sound towards Skye a very short distance away. The tales were of a few pretty wild nights where Klondikers would follow Boswell’s tradition by sleeping on the floor, usually after copious amounts of alcohol of course! The Glenelg Inn is not to be missed. 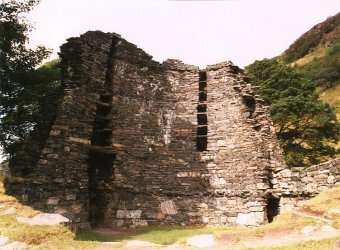 Perhaps the two things that Glenelg is best known for are its excellent examples of Pictish Brochs – ancient funnel-shaped dwellings. Dun Telve and Dun Trodden are secreted away up a very quiet lane running through woodland. Their aspect helps to aid the imagination in thinking about those days 2000 years before Christ and the way these ancient and hardy people lived. From the village during the summer months there is a small ferry service over to Skye which is not to be missed. The service carries a handful of cars and their passengers and takes but a few minutes to cross to Kylerhea. Although the Sound of Sleat appears benign to the casual observer, a memory of mine is of a TV documentary in which a Royal Navy officer was offered the opportunity to use his skills in crossing the Sound by directing the ferry. The good officer found himself some way down stream as he struggled to master the currents between the mainland and the island much to his embarrassment! My advice is for all that can to visit Glenelg at least once if possible. Please be aware that you will be back to this rare little corner of Scotland however. Sleeping 2 – 4 – pets accepted. I share your views about Glenelg and its environs entirely. We came on holiday here for many years before deciding to come and live here (in 2007). Our two grown up sons would move here like a shot if they could be assured of work. We have a self catering let and love it that we are able to facilitate other people gaining the same enjoyment from holidaying here that we always had. I would add to your eulogy on the area the fact that the people here are great and the community spirit is wonderful. I have an interest in the ferry and would be interested in more detail about the TV programme you mentioned. (Did you see the film “Made of Honour” by the way? It features the ferry, Eilean Donan etc. and is worth a watch if only for that! On a mundane note there is an “r” missing from Dun Troodden and an “e” from Skye. Thanks for dropping by, Peter. It’s nice to talk to someone who lives in that lovely place. You sound very happy there. I first visited Glenelg in around 1988 and was immediately taken aback by it’s beauty and charm. Driving over Mam Rattagan down into those fertile plains below is a striking experience – particularly for the first time. I remember my car’s clutch went and I panicked about having to be towed back over there? We were staying at the old Manse which was situated on the left of the road entering the village. I remember it very well and that it had changed somewhat when I passed through Glenelg on a later occasion. Glenelg is always one of the first destinations I recommend when people ask me about nice spots in the Highlands. If you’d like to pass on details of your self catering premises I’d be happy to place them on the article. If I can find any info regarding that programme I’ll get it to you, it’s some time ago now. Thanks for the corections, it’s appreciated. Stuart, came accross this article by accident. We have spent all our holidays in Glenelg for the past 3 years staying at The Holt. We echo your feelings completely. Glenelg is a magical place and ideal for touring Skye and the surrounding countryside. In fact we love Glenelg so much that we are getting married at the Glenelg Inn this May together with a blessing on the Skye ferry. My partner has traced his ancestors, on his mothers side, back to Glenelg and Skye. We live in West Yorkshire now but hope to move to Glenelg/ Skye when we retire in four years time. and as Peter says the community spirit in the village is wonderful. Just managed to drive out over Mam Rattagan after the snow plow. We could have been snowed in which would have been such a pleasure. Thanks for your nice comments about Glenelg, Ann. Glad you love it so much. The drive over Mam Rattagan is an interesting one at all times, it must have been even more so just following the snow plough! Congratulations to you and Dennis on your forthcoming wedding. I hope you have a day to remember and a happy life in Glenelg come the day! One of the worst places anybody could go on holiday, nothing to do but go to the local inn where you will find the local nutters being abusive to visitors and each other, the inn keeper a very leering pervert type who went around touching women in the bar. i was to find out that most of the people are related, so some where down the line there has been a lot of inbreeding, which explains the behaviour. my advice to anybody is not to go there never mind live there. if you have moved there leave quick ! Dont be taken in by flash photos and self propaganda on the web sites it is nothing like described. try plockton more normal people there. If this is a post from “John and Mary” why is it written (badly!) in the first person? As a point of fact the Inn keeper is a lovely lady who does not go around “touching women in the bar”! An indication, I would say, of the general accuracy of “John and Mary’s” post. If “John and Mary” have ever actually been to Glenelg it’s good to hear they won’t be back. They won’t be missed. I once heard that most people insult others by subconsciously transposing their own failings and foibles onto them. I rest my case. 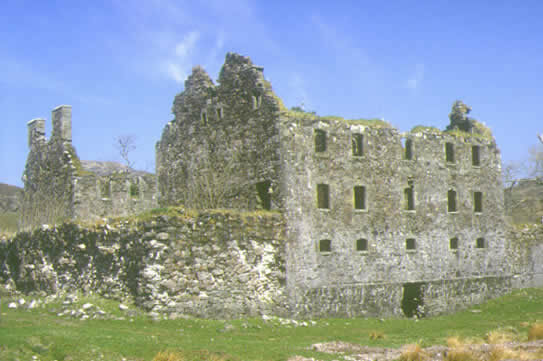 My trip was a few years ago, the inn keeper i was refering to was a man in a kilt.The comment i posted was as i and other visitors saw the place. you only have to go on to trip advisor and you will see negative comments. Also i would like to say that you must a got a good deal from specsavers on the rose tinted glasses, that you obvisously wair ! peter.